The Inca Empire, also known as the Inka Empire or Incan Empire, was the largest empire in pre-Columbian America. The administrative, political, and military center of the empire was located in Cusco in modern-day Peru. See the fact file below for more facts about the Ancient Inca civilization. The Inca Empire existed in Peru. It ran along the Pacific coast and Andean highlands from the northern border of what is today called Ecuador to the Maule River in Chile. There were over a million people who were Inca. The man who established the Inca Empire was Manco Capac in 1438. Manco Capac declared himself Sapa Inca, divine son of the Sun. He was a skilled warrior and leader who exercised absolute power. Most historians agree there were thirteen emperors during the time when the Inca Empire existed. They were sometimes called, “The Inca”. The Inca originated in the village of Paqari-tampu, about 15 miles south of Cuzco. The official language of the Inca was Quecha. The Inca had no written language. They kept their history and stories alive through stories that were passed from father to son. The Ancient Inca built aqueducts, cities, temples, fortresses, tunnels, suspension bridges, and 2, 250 miles of roads. The Inca had a great understanding of mathematics and agriculture. They also knew about hydraulics, astronomy, architecture and military strategy. The Inca had skills in music, textiles, wood and stone carving, art and poetry. The Inca were also highly skilled in working with all types of metals. Their pottery was simple, practical and beautiful. The Ancient Inca grew corn, potatoes, coffee, and other grains. They also created woven baskets and woodwind instruments. The Inca pyramids were built with mud bricks of clay that were mixed with dry straw from the corn plant. When the Incas found a pyramid that had been built by another culture, they would build their own Inca temple on top of it. Inca gold was not inherited by a person’s decedents, so when somebody died, the gold was placed inside the grave. The Incas worshipped many gods and goddesses. The major Incan god was the god of nature, Viracocha, the creator. Another god was Inti, the sun god. Gold was the symbol of Inti. The sun god temple is the most important structure in Cuzco, the major city of the Incas. The Incas believed Inti was the father of Incan rulers. They worshipped the ruler as a living god. Major Incan goddesses included those of the earth and the sea. The Incas also worshipped many lesser gods and goddesses. These included the gods of the moon, thunder, rain, stars and rainbows. The Ancient Inca’s developed important medical practices. They performed surgery on human skulls and used anesthesias during surgery. Inca medicine included treating physical and emotional problems. In 1532 the Spanish arrived in Peru and by 1535 the Inca Empire was gone. 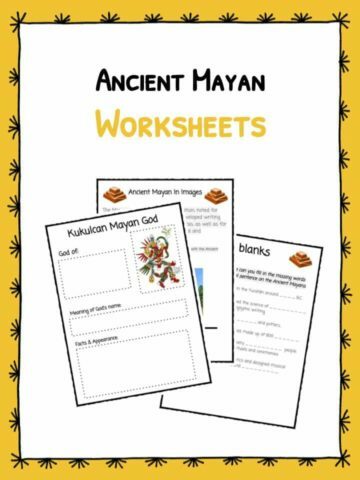 This bundle includes 11 ready-to-use Ancient Inca worksheets that are perfect for students to learn about this historical civilization and empire which was the largest empire in pre-Columbian America. 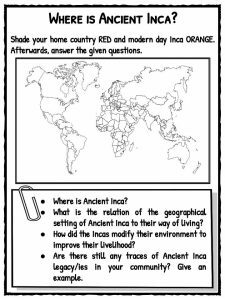 Using the included reading passage, students will shade the map in red for their home country and orange for modern day Inca. Students will read the source material and analyze Machu Picchu before describing the picture and write about the important archeological site. Students will analyze the three different images of Inca art and answer a series of questions about them. 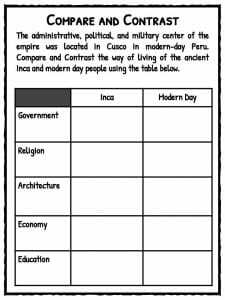 This worksheet includes 7 sentences about the Inca empire that the student will read and identify the concept being described. 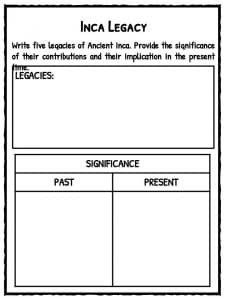 Students will write about five legacies of Ancient Inca and provide the significance of their contributions in the present. Using the included facts passage, students will work through the word search grid and identify the Ancient Inca terms. 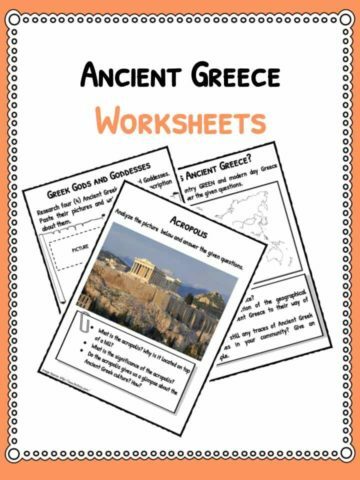 In this challenging worksheet, the student will read each statement and then justify it by completing the idea. 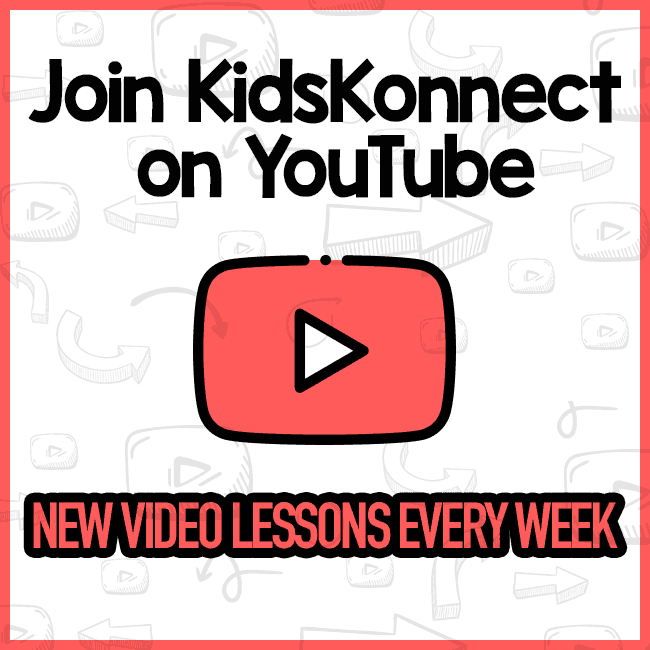 In this activity, the student will be a film director and create a plan for a documentary film featuring the legacies of Ancient Inca and their implications. 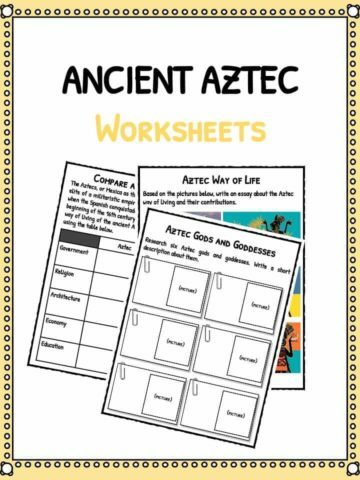 Students will use their resource and knowledge to fill in this chart about the Ancient Inca empire. The student will compare and contrast the way of living of the ancient Inca and modern day people in the provided table. Have a clear understanding about the history of the ancient Inca empire and civilization. Locate where the Inca civilization was on a map and answer questions about the location. Explain why Machu Picchu is such an important archaeological site and its implication on the history of mankind. 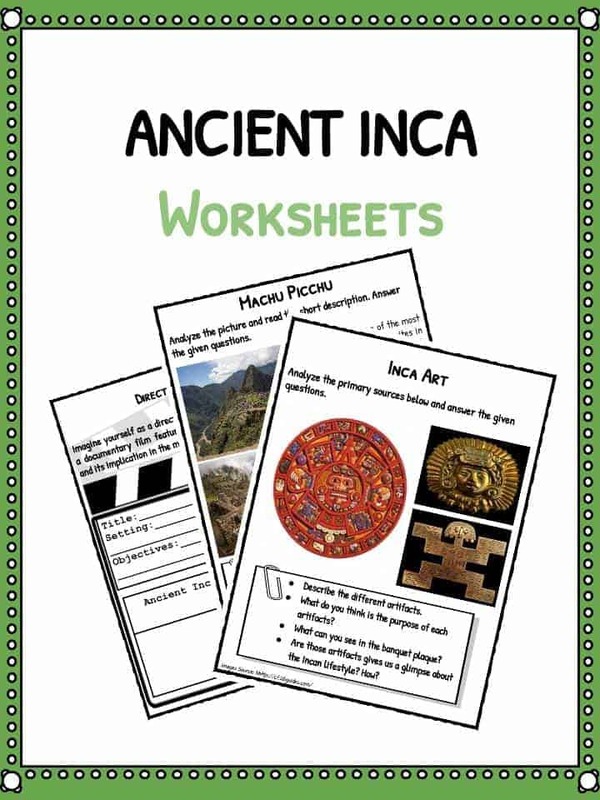 Describe different Inca artefacts and write about what their purpose was and how they give us a glimpse into Incan lifestyle. Identify the concept being described in a series of statements about the Incan empire. 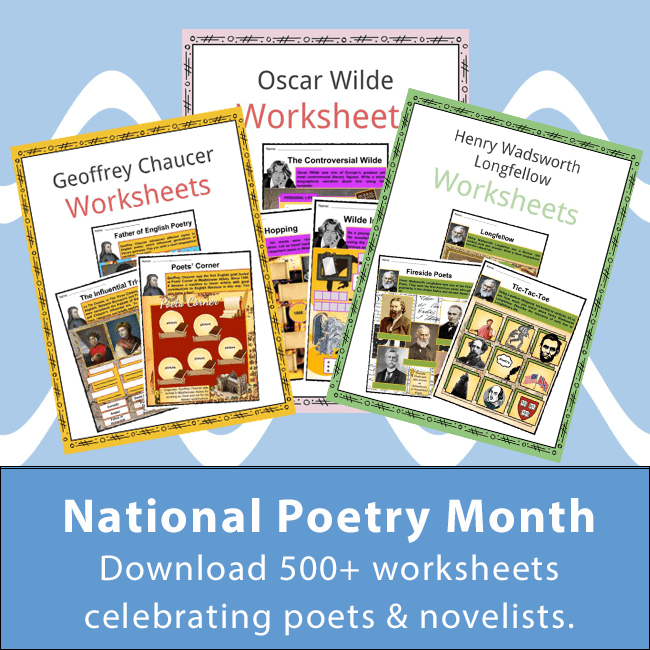 Write about Incan legacies and why thee implications of those are in past and present times. Justify statements about the Incan civilization by completing the ideas with their own thoughts. Compare and contrast the way people lived in ancient Inca to the way people live in modern day.